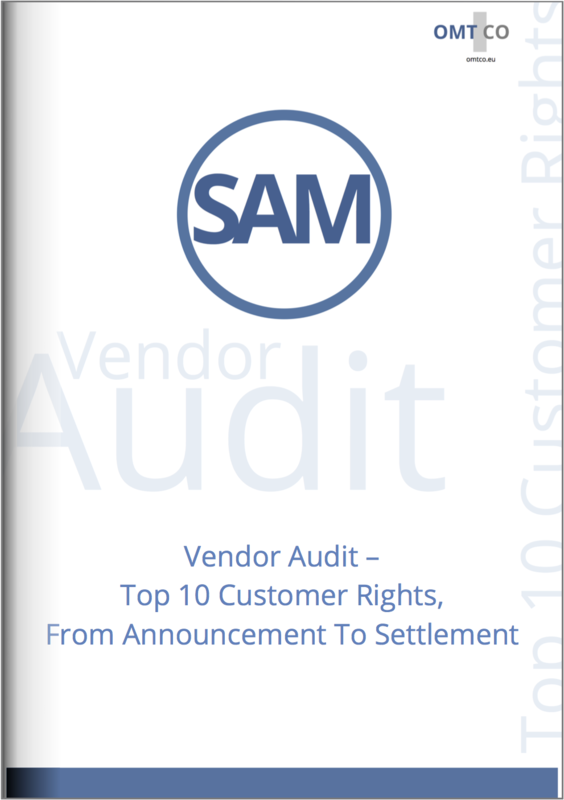 This report is aimed at those in IT-Management or Software Asset Management (SAM) confronted by a Vendor Compliance Audit. We often discover that Software Customers are unaware of the rights they possess when it comes to Software Vendor Audits. Has your organization been confronted by a vendor audit? An unusually high penalty claim? You should know and reserve your crucial top 10 rights in an audit situation – from A to S. We offer valuable guidance to customers preparing for, managing, or about to settle, a Compliance Audit. Announcement | You may expect a formal letter of announcement of the audit from the vendor, comprised of the audit’s scope, a time schedule and nomination of the vendor audit lead and mandated auditor. However, receiving this letter puts an end to any regulation of incompliance outside of a settlement. Time Plan | You may adapt the time plan to your constraints – but you may not postpone the assessment indefinitely. Data | You may restrict the auditor’s access to selected data – but you may not withhold access to licensing-relevant data. Confidentiality | You may ask the auditor to offer a guarantee of confidentiality of your data and to work in a Secure Data Room – but you must allow the vendor to access your Licensing Compliance Table (LCT), even if this may lead to a settlement penalty. Formats, Procedures, Tools | You may impose your formats, procedures and (scan) tools, such as TAD4D, iQSonar or iLMT, on the auditor – but you must allow the auditor to verify the coverage and data quality. Physical Access | You may restrict the auditor’s physical access to any person, facility, geography or devices – but you must answer licensing-relevant questions and provide data for the purpose of verification. Licensing | You may request to be provided with all licensing documentation in written form, as well as an in-depth explanation of any particular licensing rules – but you may not indefinitely challenge the “how’s” and “why’s” of licensing rules. Your Team | You may involve any employees and departments of your choice (e.g. purchasing, legal) – but you should name a Single Point of Contact (SPOC) for all audit matters. External Support | You may be accompanied, assisted or represented by any external support of your choice, such as licensing experts or legal teams – but you should define and communicate their exact roles and powers. Settlement | You are entitled to have thoroughly explained to you how the incompliance penalty has been calculated – but you must then comply swiftly with the vendor’s request to re-establish compliance. In our experience, a vendor compliance audit requires the full commitment of the client’s organization, supplemented by licensing expertise and counter-audit experience. This minimizes the workload of the client’s organization, and ensures that the audit is conducted in a fair manner. OMTCO has product and licensing expertise and counter-audit experience for all major vendors, such as IBM, Oracle, Microsoft and C-vendors, such as Attachmate, Informatica, Citrix, Infro (Global Solutions). This accelerates the audit process and ensures that all the steps of an audit occur in a fair manner – from Annoucement to Settlement! Should you wish for advice tailored to your specific needs, please call your OMTCO representative directly or contact OMTCO at counteraudit@omtco.de. HAS YOUR ORGANIZATION BEEN CONFRONTED BY A VENDOR AUDIT? AN UNUSUALLY HIGH PENALTY CLAIM? 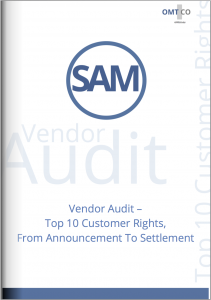 YOU SHOULD KNOW AND RESERVE YOUR CRUCIAL TOP 10 RIGHTS IN AN AUDIT SITUATION. WHEN AN AUDIT CONFRONTS YOUR ORGANIZATION, OMTCO IS BY YOUR SIDE TO PROVIDE YOU WITH LICENSING EXPERTISE, COUNTER-AUDIT EXPERIENCE AND NEGOTIATION SUPPORT.